Anyone know how to apply this to an exige? Would love to save some weight by removing the latch. Where would one mount the catch and the eyelet? Here are a couple of pictures and a quick video. Last edited by CHRISN; 05-08-2009 at 07:02 AM. thats sweet, I never knew how the exiges opened (latch on left of drivers side inside cabin) until I bought mine, a latch in the back would be nice I suppose but not necessary. You're not sure what you paid? Isn't that, I dunno, bad financial strategy? But either way, the functionality of that must be good, and it blends with the car. Can you use this with the sector 111 lid bone? Yeah I would agree but for me cars are not about financial strategy. Does anyone have the instructions on the placement of the retaining rod? I'm eyeballing it from the pictures above but that doesn't seem like the best idea. Well done Should have done that way from the word go... Are you listening Lotus? So just to better understand, these use a different key than the ignition, correct? Has anybody tried to fashion the standard keyhole into this assembly? The Touch activated Power Trunk release system works perfectly! So it's safe to say that with an Allen wrench this latch won't come off? I think you've saved my life cause I'm doing a mod where this will come handy!! Question, what happens with the alarm sensor connection? Last edited by RENDERMAN; 10-24-2014 at 12:10 PM. Has anybody else done this mod? Looks pretty slick. The forward panel that is glued to the underside of the hatch, that the stock trunk mechanism bolts to with two bolts, came loose some time ago after too much pressure was used to close a full trunk. Since then the latch has been held on only by the rear two bolts and has work well enough but it has always bothered me. I just did a half assed job trying to JB weld the front panel back up and failed miserably. Was considering taking the hatch off and doing a proper job securing the panel correctly (maybe with 3M panel adhesive?) but may do this instead. Any other experiences with the AeroCatch? How does the pin mount? Looks like Phil had some DIY writeup but it is no longer online. 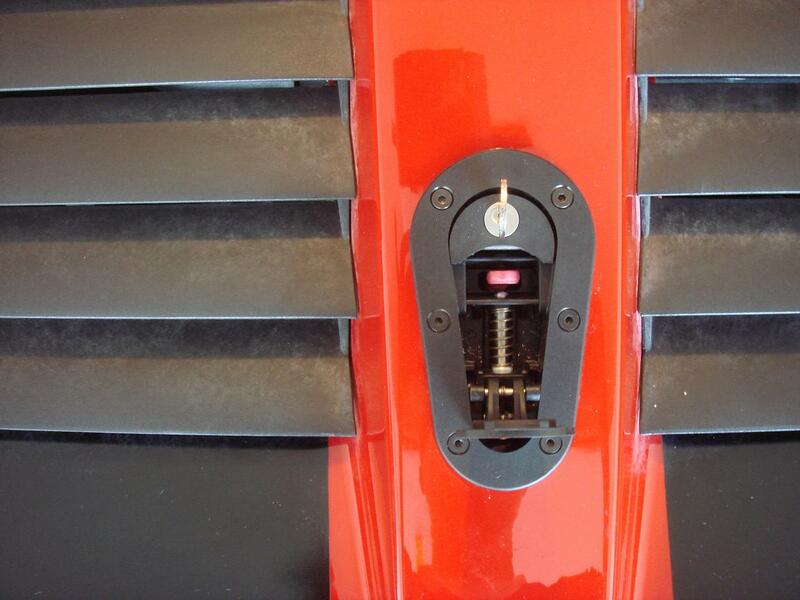 Pretty much one of the best mods I have done to my Elise... love the Aerocatch. I modified the stock latch mechanism to hold the retention pin. How much more simple could it get? I need to figure out how to coat my whole car in them.